How and When to Prune Fruit Trees | Gardens Alive! Question. I am confused about my fruit trees. The past two years I've pruned my apple,peach,pear and plum trees right after the dead of winter. But we only seem to have had one or two days OF "dead winter" this season, and I'm concerned that the trees might not go fully dormant. Is that concern warranted? And when exactly should we be pruning? I'm concerned about getting the timing right—or at least 'not horribly wrong'. Answer. Well, I've been thinking about the same thing, John—not about dormancy, but about timing. 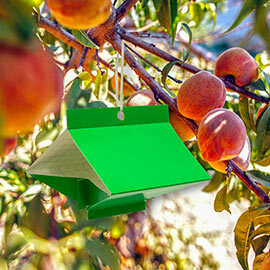 I think I've been doing the right things at the right time of year to keep my wife's peach trees as healthy and productive as possible, but I just never feel certain. And I suspect that many fruit tree growers share the same agita. And this IS the time of year to sort these kinds of issues out, so I called one of our most frequent guests and sources, Dr. Lee Reich, author of "Landscaping with Fruits" (Storey Publishing) as well as "The Pruning Book" and a new tome titled "Growing Fruit Naturally" that's due out in March (both published by The Taunton Press). First, Lee says not to worry about dormancy. The key triggers for plants to go dormant for the winter are things like lessening hours of daylight and cooler nights; they don't need to be below freezing for weeks at a time to get a good winter's rest. And your timing seems close to perfect. Lee says the ideal time to prune fruit trees is "after the coldest part of winter is over, but before bloom begins, which is typically early to mid-February." And if you're going to err, Lee feels it's safer to prune a little bit later rather than earlier—especially with peaches. When my trees were in their second year, I called Lee to say that I was completely taken by the beauty of the flowers, which I felt put apple blossoms to shame (he agreed), and I asked him if the trees would be harmed by my waiting to prune them until after the big show was over (so I could enjoy every peach blossom). He said that he saw no problem with letting the trees flower first, and in our recent talk actually moved it up into the 'good idea' category. "Peach trees can often suffer a little winter injury", he notes, "and letting them flower clearly shows you which branches have been winter killed. Plus," he adds, "pruning wounds heal fastest when the tree is just beginning to grow for the season, and that fast healing helps limit problems from pathogens trying to take hold in the cut areas." Just for peaches, I asked? "No; any tree can be pruned while it's in flower and you'll get those same benefits," he replied. But he quickly added that "peaches DO require the heaviest pruning of any fruit crop. You need to make thinning cuts and heading cuts—to keep the center of the tree open and to stimulate new growth for the following year. And in general you need to cut more than you probably think you should." I agreed, and explained that while I thought I was pruning pretty aggressively every season, some of my trees were clearly still way too lush and full when they leafed out. "You need to prune by the cat tossing method", he replied. "You need to prune so that, when you're done, you could take a cat and easily toss it through the openings between the remaining branches." I asked if he had a 'tree cat' he used for this purpose. "No comment," he answered quickly, then added, "if the image disturbs you, imagine pruning so that a large bird can fly through the remaining branches easily." I told him I kind of liked the image of the flying cat. "People tend to remember the advice more with that one," he noted. READ COMPLETE ANSWER "Apple trees don't need to be pruned as aggressively," he continued, "but they still need lots of thinning when the fruits begin forming." Ah yes, the thinning of the fruits. I told Lee how guilty I feel when I'm out there filling five gallon buckets with little baby peaches—not to mention how time consuming the process is. "It's absolutely essential", he stresses. 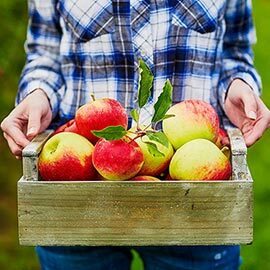 "Peaches and apples need to have the vast majority of their developing fruits removed if you want to harvest good quality fruits at the end of the season. And the sooner you remove them, the better results you'll get. Get all of the extra fruits off the tree while they're still tiny and the tree can then devote the maximum amount of energy to the ones that are left behind." Is this another area, like peach tree pruning, where people typically don't go far enough? "Absolutely", replied Lee, who would probably have been waving a finger disapprovingly at me if we weren't talking on the phone. Maybe he was anyway. "It's been estimated that to get the ideal harvest of big, well-shaped fruits, only one apple blossom in twenty should be allowed to set fruit," he explains. "That's right: Five percent," he assured me. Looks like I'm going to need a bigger bucket.